As the proud mother of a now two-year old daughter, I thought I’d record some of my and my firstborn’s favorite things from this past year as helpful ideas for gifts from grandparents. You can see last year’s 0-12 month post here. Clothing is always a good present as kids are always outgrowing clothes and my rules on affordability from last year still held true ($4 per item is an okay price) for the X-Month sizes, but once you reach the T sizes (2T, 3T, etc.) the okay prices are more like $5-6 per item. 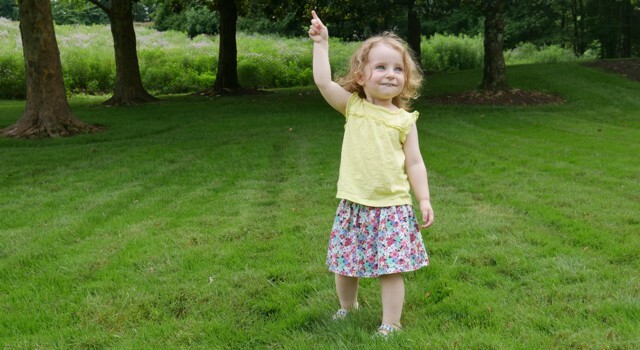 As a toddler, sizing gets easier as 18 month sizing works until they are 18-months old. The 24-month or 2T sizes are effectively the same. The main difference is that 2T tends to feature more practical designs for walking kids, more adult styles, and higher prices. After the first year, children start to make their passions known. My daughter loves to see and identify cats, dinosaurs, cars & trucks, and owls. Also, after the first year, children start to make their independence known. Getting dressed can be a chasing game, a meltdown, or an enjoyable excitement depending on the day and the outfit. The right pattern, material, and enclosures can make the difference. Look for patterns that reflect their interests. I can get my strong willed toddler to get dressed in a flash by telling her there is a kitty on her shirt or by pulling out a soft dress. Opt for fabrics that feel nice, especially around the neck and on the inside. Scratchy lace is pretty and baby jeans are cute but toddlers are sensitive and might reject ever wearing the outfit based on its feel. If you’re shopping online, 100% cotton will be the cheapest material that is likely soft. Onesies are still nice but as they get older and taller regular outfits become easier to put on and grow with. Relief snaps or buttons by the neckline of shirts allow for easy slip on without brushing that sensitive nose. Leggings or other pants that rely on stretch to fit will be the first they outgrow. I find here in Virginia, short sleeve shirts and long pants have been the most versatile clothing as jackets can be added to warm up and the pants can be rolled to cool down. Again, after the first year, children start to make their passions known. Books tailored to their interests are best. That being said, here are my and my daughter’s favorites. T is for Truck has lasted another year as one of my daughter’s favorites. She loves it so much it is her preferred method of stalling bedtime. My daughter also loves The Book with No Pictures by B.J. Novak. It’s silly sounds and phrases inspire deep belly laughs which are a real treat to us all. The book also has played an integral role in helping my daughter realize that the printed words are how the reader knows what to say as that is the subject of the book. For the library, my daughter was asked to select her favorite library book to recommend to other children. She selected Piggy Pie Po by Audrey and Don Wood, which is a fun rhyming book that has three separate silly illustrated poems in it. I recommend the board book. Colors. The transparent pages allow you to “mix” orange, green, violet, and brown with the turn of a page! My daughter will also be the first to tell you that there is a picture of a banana in it. The Ladybug and Other Insects. We have a lot of ladybugs around our house and because of this book she enjoys watching them. I Can’t Sleep by Philippe Dupasquier is an amazing book. It is a story told by an illustrator. The wordless pages allow each reading of the book to be slightly different. We’ll read it through once and tell the story. Then immediately again to point out where all the moons are or as an eye spy game. It fosters a nice independence as even those who cannot read yet can read this book. And then there’s Pigs Aplenty, Pigs Galore which is a very funny illustrated poem which everyone enjoys very much. To the adult reader, it is descriptive of the chaos of having children in your house. To the child, it is a funny story about inconsiderate pigs. Music. We were given the Hape Wooden Drum, Tambourine, and Rhythm Set and we like them all. The two rhythm instruments are my daughter’s favorite as they are the most versatile for creative play. The drum is small enough it makes a pleasant noise even when hit very hard. The tambourine is the least played but my husband or I use it sometimes to make an impromptu dance song for us all. Art. A set of large size washable crayons is a great present as soon as they stop putting everything in their mouth. If you aren’t sure when that is, make this a gift for babies older than18 months. Water. Double handled cups. Pouring, drinking from a cup, and washing your hands are all fun games and real tasks for toddlers. A tea set or a fun tub or basin to fill with water are all great gifts. Moving. Learning to walk, jump, balance, push, and pull are all fun for toddlers. My daughter loves Marcel the Cat, a pull behind toy. They make the string too short because they can list it as acceptable for younger aged children (it could be a choking hazard if it were longer requiring an older age be listed). We tied another piece of ribbon onto it attached to a large jingling cat toy so that she could both hold the string better and actually pull the cat. She also enjoys a rocking horse but only after she watched someone else show her how you rock. My daughter’s favorite plastic toy the past year has been LEGO Duplos. Although they are very expensive to buy new, you can buy Duplos by the pound on eBay for much cheaper. The primary toys from her first year of life which has just as much value to her in her second year of life have been her stuffed animals. She grows more attached to those as time goes on. A 529 college savings account or even just a stock or two in a custodial account can be helpful savings. The power of saving and investing while young means that this will be the gift that keeps on giving. We present children with gifts that expose them to ideas and possibilities about the world. Unlike adults who use sensitivity in their response to gifts, children often have very clear favorites and least favorites; they don’t love each gift equally. But sometimes the duds are as important as the successes at helping the toddler. Life is enriched by being introduced to a wide diversity of items, experiences, and facts. The process of learning what you enjoy in life includes learning what you don’t enjoy as much. So don’t be discouraged if even after lots of research picking what seems like the perfect gift, you find out it isn’t a favorite. They don’t have to be amazing to be a great gift.